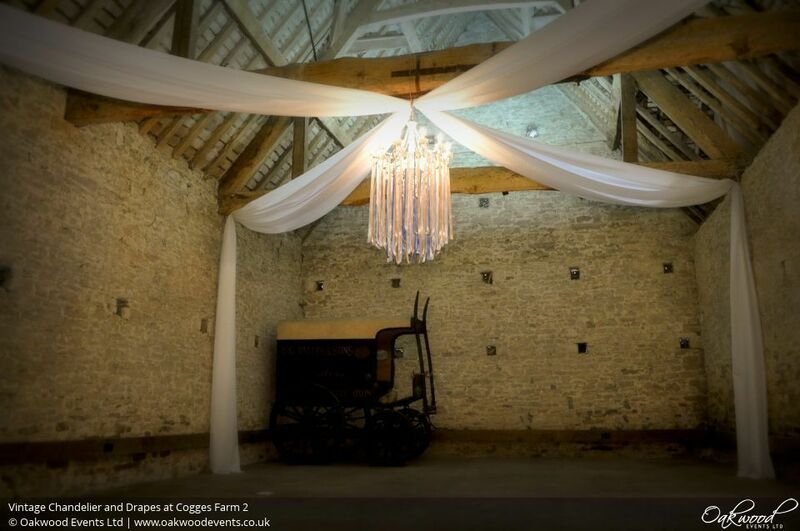 Our white vintage style chandeliers look fantastic in the rustic setting of the barns at Cogges Manor Farm. Shown here with lots of colourful pastel ribbons and positioned at the centre of a four-point star of fabric drapes. Chandeliers are a great choice in these large barns because they give lots of soft, warm light that is fully controllable to set the mood for the different parts of the day - bright yet welcoming and pretty for the drinks reception and meal, then dimmed and intimate in the evening. We have several styles of chandelier available including vintage, crystal and rustic cartwheel / Edison bulb styles. Drapes are the ideal way to soften the lines of the barn, adding style and a cosy atmosphere to this large space. Options include a star formation, as shown here, or an up-and-over style to create an arch shape underneath the beam. Our main Cogges Farm lighting page can be found here, or feel free to contact us here to discuss lighting ideas for your wedding in this gorgeous venue! 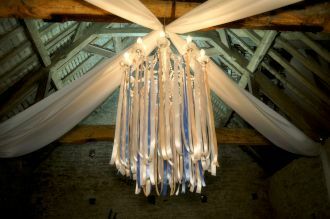 I just wanted to say thank you to you and your team for providing the lighting at our wedding at Loseley yesterday. The fairy lights looked stunning and everyone kept commenting on how beautiful the lights were. Without them I think the barn would have looked bare and no where near as cosy. So thank you again for everything you've all done.